Stick around Los Angeles long enough, and you’re bound to end up in a movie. It’s a rule that applies mostly to humans, but as any location scout can tell you, it’s also true about buildings. You might call Union Station a supporting cast member, like a Karl Malden or Stanley Tucci, an actor who rarely takes the lead but nevertheless shines in the background. Over the years, the station has played a wide range of roles, from a bank in the 1960s (the 2002 period piece Catch Me if You Can) to a library in 1997 (Most Wanted). But it also tends to play itself, or some version of itself. Like a lot of great actors, Union Station is at its best when it finds a part that suits its persona—in this case, a grand, dramatic space with the unmistakable ambiance of the golden age of Hollywood. 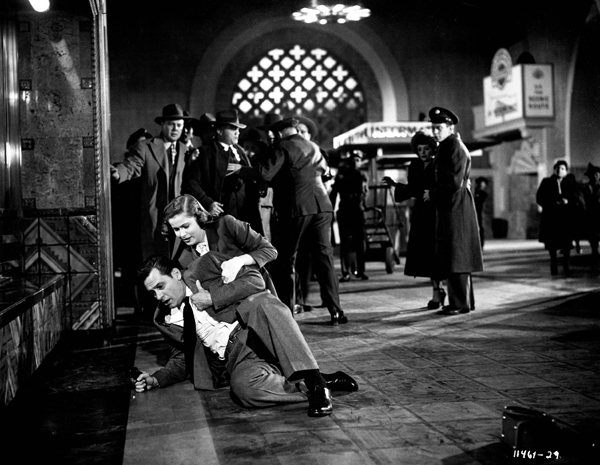 It’s no accident that some of Union Station’s earliest roles were in film noir. There’s an inherent drama to a train station—a place of hellos and goodbyes, of thronging crowds and lonely anonymity—that suits the genre. You can see Union Station in a small but standout role in Criss Cross, a 1949 Robert Siodmak picture starring a baby-faced Burt Lancaster and Yvonne De Carlo (well before her career playing the matriarch in television’s The Munsters). The movie sticks mostly to generic backdrops—the dark alley, the dive bar—until Union Station shows up about halfway through. Suddenly, Criss Cross comes alive as the two stars zigzag through the station’s marble-lined spaces, each time missing each other by a narrow margin. Then, of course, comes the fateful moment. 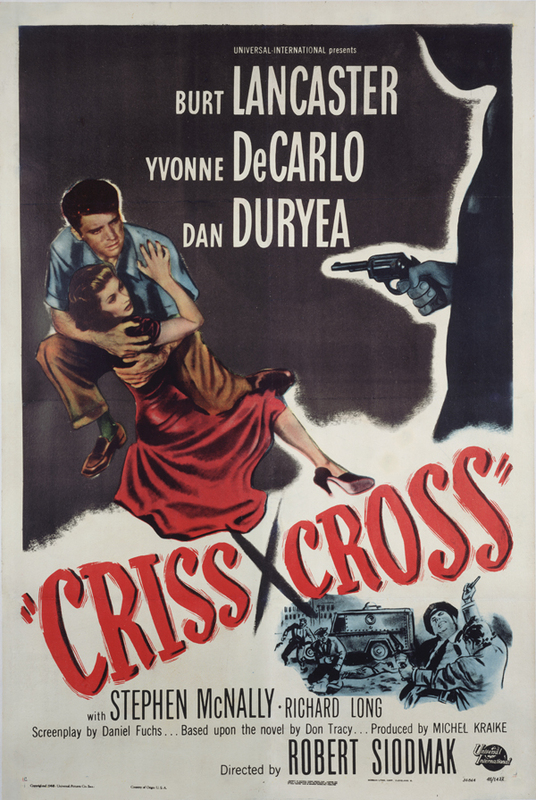 Promotional poster for Criss Cross. Courtesy of Universal Studios Licensing LLC. “If I hadn’t been hanging around Union Station that day,” Lancaster says in the obligatory tough-guy voice-over, “if the clerk at the news stand hadn’t picked that moment to run out of cigarettes, to reach down for a fresh pack—.” And there, across the room, suddenly visible, stands De Carlo in a white dress, framed against the station’s handsome windows. Composer Miklos Rozsa piles on the strings, but much of the moment’s romance comes from its evocative setting. Behind-the-scenes photograph during the filming of Criss Cross, from 1949. A prominent scene was filmed at Union Station, using both interior and exterior shots. Courtesy of Universal Studios Licensing LLC. 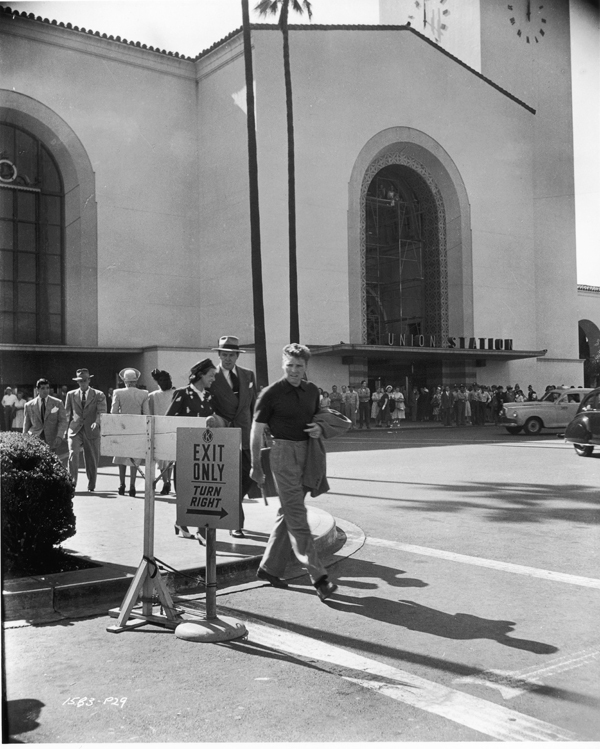 The following year, 1950, saw the release of Union Station, which was practically a star vehicle for the building. Here, the space gets to play its Chicago counterpart of the same name, and it’s a natural fit: The angular pillars and circular chandeliers of the station have a neoclassical stateliness usually associated with America’s older cities. The plot of Union Station centers on the kidnapping of a blind girl, and the train-station cop (William Holden) who investigates the case. In this film, Union Station isn’t merely a backdrop but a central player in the story. Cops and crooks repeatedly circle one another across the gleaming floors; the baggage lockers are the site of a climactic cash-swap. In a memorable touch, a lattice of intricate woodwork conceals a small peephole through which cops monitor the station’s activities. 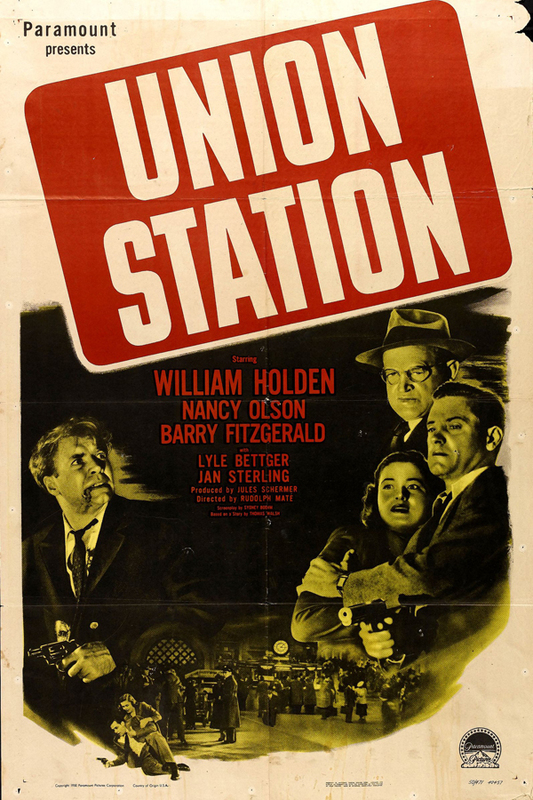 Promotional poster for Union Station. Courtesy of Paramount Pictures. Union Station’s director, Rudolph Maté (D.O.A., When Worlds Collide), uses just about every possible inch of the station except, obviously, the palm trees that line its distinctively Californian exterior. For a good, long look at the building, Union Station remains the best cinematic document of the building. Still from Union Station, the 1950 film in which Los Angeles’ station plays its Chicago counterpart of the same name. No mere backdrop, the director filmed extensively throughout the station. Courtesy of Paramount Pictures. In 1973, Union Station appeared in a genuine blockbuster, Sidney Pollock’s two-time Academy Award–winning romance The Way We Were. Set largely during the 1940s and 1950s, the movie starred Robert Redford as Hubbell Gardiner, a golden-haired WASP bred for success, and Barbra Streisand as Katie Morosky, a far-left Jewish radical. A turning point in their fragile romance comes when Katie returns from an anti-McCarthy protest that threatens Hubbell’s fledgling career as a screenwriter. He picks her up at Union Station. It’s a significant choice. Pollock could have set the scene at an airport—Streisand is returning from far-off Washington, D.C.—but Union Station serves a couple of purposes here. It becomes a metaphorical and literal crossroads for the romantic couple, as well as a symbol of the Hollywood life that an Easterner like Katie could not fit into. And visually, Union Station simply looks better than any airport. Streisand and Redford, assaulted by a crowd of red-baiters, take refuge in the dark, empty space of the Fred Harvey restaurant, where their conflicting philosophies—capitalism versus socialism, comfort versus affliction—reach an impasse. “It’s always fun meeting trains, y’know?” Redford says bitterly. The Way We Were set the stage for Union Station’s career for the coming decades, a fairly prolific stretch in which it became typecast as itself. In one period piece after another, the station became visual shorthand for Los Angeles in the romantic era of fedoras and cigarettes. Its roles were often just brief establishing shots, but it shows up in Guilty by Suspicion, Irwin Winkler’s 1991 drama set in McCarthy-era Hollywood; the 1981 crime drama True Confessions, loosely based on the 1947 Black Dahlia murder and starring Robert De Niro and Robert Duvall; the 1991 drama Bugsy, starring Warren Beatty, about the gangster Bugsy Siegel; and many others. Nick of Time, a 1995 thriller starring Johnny Depp, was set in the present day, but its opening sequence—in which a young girl is kidnapped in Union Station—gives the whole movie a bit of old Hollywood flair. In those years, Ridley Scott’s 1982 science-fiction classic Blade Runner arguably made the cleverest use of Union Station. It’s also a period piece of sorts, set in the faraway year of 2019 and starring Harrison Ford as a bounty hunter who chases down humanoid “replicants.” The movie is set in a dystopian but not implausible Los Angeles that has become (as if it weren’t already) a sprawling megalopolis defined largely by its immigrant cultures, teeming with foreign cuisines and global languages—a cultural mélange of Tokyo, Beijing, and Manhattan. Somewhere in the middle of this neon-lit sprawl sits a musty old police station, whose grand archways and vaulted ceiling unmistakably belong to Union Station. It’s a visual throwback to the precinct offices seen in so many old film noirs—dark wood, slowly rotating fans, dust motes hovering in beams of dying sunlight—and it grounds this science-fiction film in a familiar genre. The setting also gives Ford’s character a shadowy past—he’s a former cop—straight out of Roman Polanski’s Chinatown. Union Station, though seen only briefly, somehow ties the histories of the real Los Angeles and the cinematic one together. Christopher Nolan borrowed a bit of this ambiance for Union Station’s most high-profile appearance over the past few years, in The Dark Knight Rises. The final film in Nolan’s Batman trilogy brings the comic-book hero into a very real and troubled world, as his beloved Gotham city spirals into class warfare, terrorist violence, and rioting. The populace has set up a kangaroo court to make the city’s wealthiest men pay with their lives. The backdrop may look like a New York courthouse or mayoral mansion, but it’s none other than Union Station. It was a surprise appearance from the station, which had lately returned to journeyman work. (It had recently shown up in the 2009 horror movie Drag to Me Hell with a train platform sucking a victim into Hades.) In The Dark Knight Rises, the station is overrun by human vermin, its handsome ticketing area strewn with leaves and newspaper, its glamorous aura polluted by Batman’s old nemesis, Scarecrow (played by Cillian Murphy), who presides over the insanity. It’s an unusual role for this architectural grand dame—a bit like Bette Davis ugly-fying herself to play a mad hag in Whatever Happened to Baby Jane? But it’s also proof that Union Station, even at seventy-five years of age, still has something to offer. 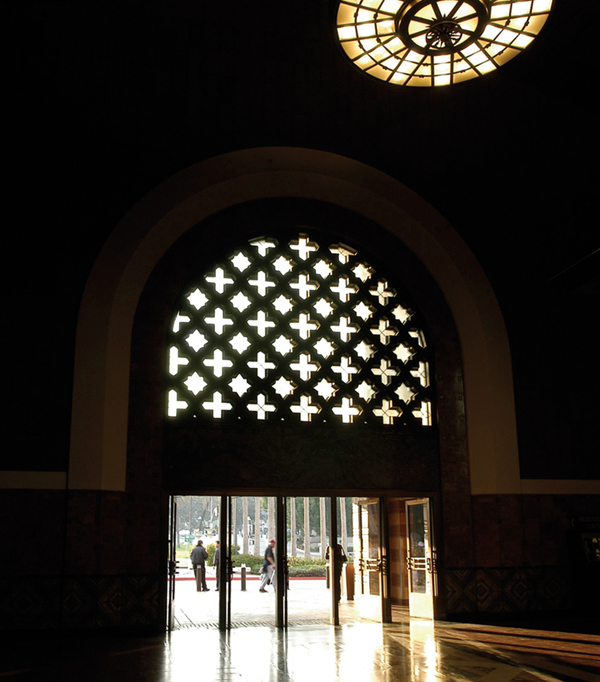 Part of Union Station’s onscreen longevity may have to do with its unlikely place in Los Angeles culture. It’s a train station in a city built around the automobile, an architectural gem in a region famous for natural beauty. Landmarks like the Empire State Building and the Golden Gate Bridge may be more famous, but they can only play themselves. When Union Station flickers across a screen, though, most viewers see only the role, not the building—a seasoned supporting player that holds a special place for Angelenos, who can always recognize it as a homegrown star. Rafer Guzman is the film critic for Newsday and a member of the New York Film Critics Circle. He is the cohost of the WNYC podcast Movie Date and a regular guest on the station’s news show The Takeaway. He was previously a staff writer at the Wall Street Journal, among numerous other publications. LAUPT is one of my favorite places to be in the whole wide world.